Wow! On top of an already busy month, my computer hard drive gave up on me, causing a small amount of panic. Do not fret, it appears that all data was recovered and my techie husband was able to get it all back on the new shiny new hard drive now safely residing inside my computer. But just in case that wasn't enough drama (can you really ever have enough drama? I'm from the school of thought that says no), Michael's work laptop also did a little funky dance of its own. Thankfully it was under warranty and he was shipped a brand new laptop. Which sounds nice at first, but you have to know Mike makes his computers do a ton of stuff, just short of jumping through rings of real fire. So to get it set up how he needs it to be means putting in some serious hours. Just for the added fun, and by "fun" I mean "temporary torture while Heather figures out how to work this thing", we also went and got a network back up thingy (oooh! So technical!) that is constantly backing up all our computers so that the hard drive suicide we experienced a week ago doesn't necessarily cause hours of fretting and tears ever again. We have an external hard drive that we manually used to back things up, but that only helps if you remember to back things up! And the last time we did that was January. We've still got some work ahead of us as Mike continues to work on his laptops, and then the next big surprise for the kids will arrive on Friday... a computer of their own we got for a song! We'll need to put it in full parental lock down, but I'll be happy to not have to share my primary computer with them. 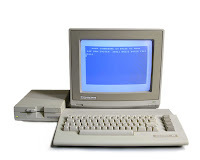 I remember when we got our first computer growing up... a Commodore 64 (shown above) which the entire family used. The thought of a household having more than one computer seemed incomprehensible. The thought of a five year old having his own computer was beyond incomprehensible, right into laughable! And now we have between six and eight computers in our house alone (on various parts of the working spectrum) for a family of four. I love, love, LOVE living right here, right now, in this moment in history. Life is good. And I have sooo much to update you on! We've had some fun adventures since we spoke last! So keep an eye out - it's coming!